The example displays the signal strength of all satellites in view. Any satellite that is currently used to calculate the GPS fix has been marked pink. The number at the bottom of each signal bar is the individual satellite identifier. 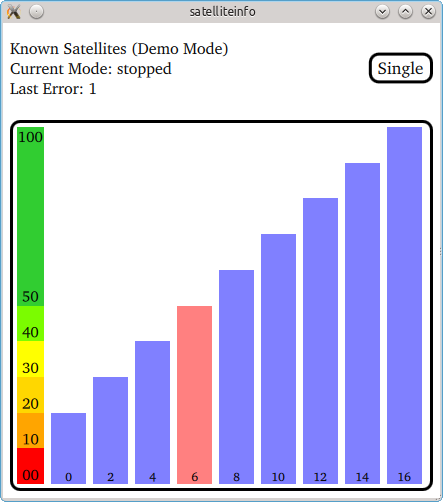 running The application continuously queries the system for satellite updates. When new data is available it will be displayed. stopped The application stops updating the satellite information. single The application makes a single update request with a timeout of 10s. The display remains empty until the request was answered by the system. If the platform does not provide satellite information the application automatically switches into a demo mode whereby it continuously switches between predefined sets of satellite data.